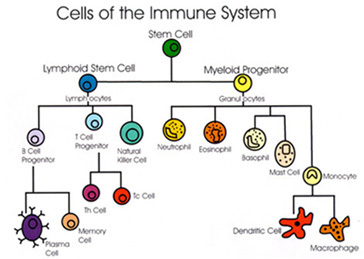 Immune cells are involved in an immune response or associated with an immune response. Including lymphocytes, dendritic cells, monocytes/macrophages, granulocytes, mast cells and so on. CIK refers to "cytokine-induced killer cells". CIK is a kind of heterogeneous cell population with CD3 + CD56 + cells as the main effector cells cultured under the action of CD3 monoclonal antibody and various cytokines (including IFN-g, IL-2 and so on), which possesses both T lymphocytes of potent antitumor activity and NK cells (natural killer cells) of non-MHC (major histocompatibility antigens) with limited tumor killing ability. Copyright © Bellastem Biotechnology Limited. All rights reserved.